The October 2018 meeting of the Mid-Michigan Photography Club is scheduled for 6:30 p.m. on Wednesday, October 3, 2018 at the First Presbyterian Church, 510 W Ottawa St, Lansing, MI. The annual MMPC elections will be conducted at the October meeting. The presenter will be Attorney John Mashni, on Copyright Law. Because of the nature of this meeting, attendance is limited to members in good standing ONLY – dues for 2018-19 must be paid to attend. As a follow-up to the previous Lightroom Workshop, The Mid Michigan Photography Club is pleased to sponsor an interactive workshop to help members to use Lightroom to improve their images. This presentation will be a follow-up on the first workshop and will provide opportunity for participants to work on their own images with guidance from the presenter. John Stine will again lead the workshop on Saturday, November 3, 2018 the First Presbyterian Church, 510 W Ottawa St, Lansing, MI from 8:00 a.m. until noon. Registration costs will be $20 for MMPC members and $40 for non-members. A registration opportunity will be available at the October MMPC meeting on Wednesday October 3. The registration form for the event is available at http://mmphotoclub.com/wp-content/uploads/2018/09/Lightroom-Registration-Form-102.pdf and can be mailed with payment to MMPC, 10727 Keefer Hwy, Portland, MI 48875 or the registration form can be submitted at the October MMPC meeting. Attendance will be limited to the first 30 registrants. Thanks to David Smalldon and Paul Bielawski for their Pic & Share presentations at the September MMPC meeting. MMPC members voted on revised by-laws at the September meeting. The MMPC elections for Vice President, Secretary, and Member At-Large will take place at the October meeting. At the September meeting we began collecting the dues for the year, we have kept the cost of being a club member to $35 again this year. Send payments to: Karen Towner, 10727 Keefer Highway, Portland, MI 48875. If you can’t make the meeting send payments to: Karen Towner, 10727 Keefer Highway, Portland, MI 48875. Setup – Thursday, November 15, 5:00 – 6:00 p.m.
Take-Down – Monday, January 28, 2019 5:00 – 6:00 p.m. The fee for participation in the gallery show must be paid at the MMPC meeting on November 7, 2018. There are two forms that must be submitted to participate. There is the Riverview Church Artists’ Agreement, and the Application for MMPC’s 2018 Riverview Gallery Show. The September 2018 meeting of the Mid-Michigan Photography Club is scheduled for 6:30 p.m. on Wednesday, September 5, 2018 at the First Presbyterian Church, 510 W Ottawa St, Lansing, MI. David Smalldon and Paul Bielawski will offer Pic & Share presentations. An update on MMPC Board elections and By-laws is planned. The theme for the Big Cookie competition in September 2018 is Pets. At the September meeting we will be collecting the dues for the year, we have kept the cost of being a club member to $35 again this year so please bring that with you to the meeting. If you can’t make the meeting send payments to: Karen Towner, 10727 Keefer Highway, Portland, MI 48875. The MMPC Board is recommending that the MMPC membership make a change in the by-laws. The current by-laws provide that the Vice-President will succeed the President at the end of the term. The proposed by-law amendment changes this provision such that any MMPC member may be nominated and serve as vice-president and that any MMPC member that has served on the MMPC Board may be nominated and serve as president. The MMPC membership will be asked to vote on this change in the by-laws at the September meeting. MMPC is planning an Upper Peninsula Waterfalls Weekend (Munising area mostly) on October 12th through October 14th. You must be a member in good standing in order to go on this trip (i.e. dues paid at September meeting). Non-members can pay the $35 to become a member if they want to go on the trip. In order to plan for locations and logistics the deadline to sign up for this trip is the September meeting (September 5th 2018). The waiver which will act as a sign in sheet. If you plan on going please bring this to the meeting. We are encouraging car pooling for saving on gas as most areas up there don’t allow for many cars. During the meeting after everyone hands in their waiver we can try to coordinate how many people are going and see if we can set up car pooling then. Take-Down – Monday, January 29, 2019 5:00 – 6:00 p.m.
Plan to arrive no later than 9:30 p.m. Please RSVP on the MMPC Facebook page at https://www.facebook.com/events/221653251838329/ or by email to mmpclansing@gmail.com. 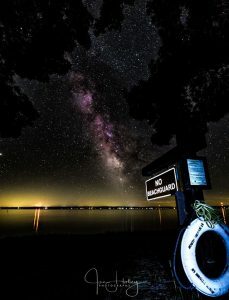 This field trip is a follow-up to the August MMPC meeting where Joe Holley and Rich Wyllis discussed astrophotography. As for light pollution, Fox Observatory is typical of Southern observing sites where you can see City Light domes on the horizon but the Milky Way is very visible as we are far enough away from the big cities to view it. If you are not going to spend the night you will need to park in the lot below the observatory near the beach. The cost is $15 for 1 night. They have plenty of room for tents and RV’s. The 8th Annual Fox Park Observatory Star Party is being held at Fox Memorial Park near Potterville, Michigan, SW of Lansing. All but $5 of every registration fee goes directly into the Observatory’s fund that is used for upgrading, maintaining and operating this fantastic public observatory. The star party is our annual fundraiser to help offset costs of operating the observatory. It’s a gathering of amateurs from around the area for a weekend of imaging and observing. It’s an overnight, 3 night event. You’re more than welcome to join us on the 11th but just keep in mind this event is a little different than the normal public night. Power for any and all astronomical equipment is available at no charge. There is a nice beach, walking trails, decent restrooms (sorry, no showers other than the outdoor beach shower), playgrounds and plenty of room for tents and RV’s. If you don’t like to camp, there are hotels available within 5-15 miles in Lansing and Charlotte. While Fox Park doesn’t offer the pristine skies of northern Michigan, the skies are still more than dark enough for serious observing and imaging. Limiting Magnitude at Zenith is approx 5.5 to 5.7. The location is close to Interstate’s 69 and 96 so it is easily accessible for all the major cities of southern Michigan and beyond. The main purpose of the event is to give all of us obsessed astrophotographers and observers a long weekend to hang out and observe/image our night skies while at the same time helping a great facility continue to introduce our great hobby of amateur astronomy to hundreds of new people every year. Bring your camping gear and equipment or take a peek through the observatory’s numerous telescopes. There is absolutely no white lights allowed after dark as this is an amateur observing event and typical star party rules are enforced. All of the volunteers should be there that day observing and/or Imaging so there will be more than adequate assistance if you have any questions. Sadly, MMPC has lost another member. Bryan Renaud has been with us since nearly the beginning of the club and has been with our Board of Directors, assisting with our programs for nearly as long. 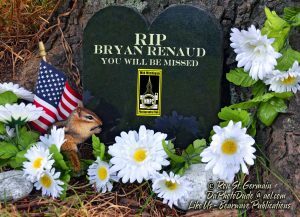 Bryan performed a lot of behind the scenes organizing & assisting in many club activities including the annual open house & gallery show to name a few – he will be missed! Here is a link to Bryan’s viewing and funeral. The August 2018 meeting of the Mid-Michigan Photography Club is scheduled for 6:30 p.m. on Wednesday, August 1, 2018 at the First Presbyterian Church, 510 W Ottawa St, Lansing, MI. Joe Holley and Rich Willis will present on Astrophotography. The theme for the next Big Cookie competition in September 2018 is Pets. The annual MMPC Gallery Show will be held again at the Riverview Church – Holt Venue. The dates will be November 17, 2018 – January 27, 2019. All MMPC members are encouraged to enter. The pricing to enter will be $10 for up to two images. MMPC is planning an Upper Peninsula Waterfalls Weekend during the weekend of October 12, 2018. A trip to the Big Sable Lighthouse is being planned for November, 2018. More information will be provided at the August MMPC meeting. This meeting featured the annual MMPC Scavenger Hunt. A scavenger hunt gallery is on the MMPC web site at http://mmphotoclub.com/gallery/. The July meeting of the Mid-Michigan Photography Club is scheduled for 6:30 p.m. on Wednesday, June 11, 2018 at the First Presbyterian Church, 510 W Ottawa St, Lansing, MI. Note that the date is a week later because of the Fourth of July. This meeting will feature the annual MMPC Scavenger Hunt. Bring your camera and anything else, such as a tripod, that you may need to take pictures in the downtown Lansing area. MMPC members will work in groups and then post their best photos on the MMPC Facebook group or send photos to mmpclansing@gmail.com. A scavenger hunt gallery will be posted on the MMPC web site. Thanks to John Stine for presenting the Lightroom Workshop. Participants were enthusiastic and provided ideas for next steps in post processing of images. MMPC is planning an Upper Peninsula Waterfalls Weekend during the weekend of October 12, 2018. A trip to the Big Sable Lighthouse is being planned for November, 2018. 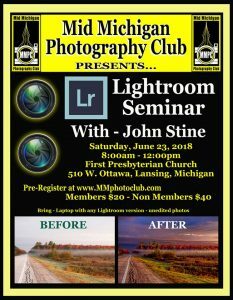 Rreminder – MMPC Lightroom Workshop – Saturday June 23 – 8:00 a.m.
Just a late reminder that there is still an opportunity to register at the door for the Mid-Michigan Photography Club Lightroom Workshop, this Saturday, June 23, 2018 at 8:00 a.m. This will be an interactive workshop to help members to use Lightroom to improve their images. John Stine will lead the workshop at First Presbyterian Church, 510 W Ottawa St, Lansing, MI from 8:00 a.m. until noon. Registration costs will be $20 for MMPC members and $40 for non-members. Attendance will be limited to the first 30 registrants. Based on the Facebook survey of MMPC members and member interest in Adobe Lightroom, The Mid Michigan Photography Club is pleased to sponsor an interactive workshop to help members to use Lightroom to improve their images. John Stine will lead the workshop on Saturday, June 23, 2018 the First Presbyterian Church, 510 W Ottawa St, Lansing, MI from 8:00 a.m. until noon. Registration costs will be $20 for MMPC members and $40 for non-members. A registration opportunity will be available at the June MMPC meeting on Wednesday June 6. The registration form for the event is available at http://www.mmphotoclub.com and can be mailed with payment to 10727 Keefer Hwy, Portland, MI 48875 or the registration form can be submitted at the June MMPC meeting. Attendance will be limited to the first 30 registrants. Congratulations to Diane Sanderson, Judge’s Choice and Randy Eberbach People’s Choice for their June winning entries with the theme of Buildings. Those images are now in the gallery at http://mmphotoclub.com/competitionbig-cookie/. The theme for the next Big Cookie competition in September 2018, is Pets. The July meeting of the Mid-Michigan Photography Club is scheduled for 6:30 p.m. on Wednesday, July 11, 2018 at the First Presbyterian Church, 510 W Ottawa St, Lansing, MI. Note that the date is a week later because of the Fourth of July. This meeting will feature the annual MMPC Scavenger Hunt. Bring your camera and anything else, such as a tripod, that you may need to take pictures in the downtown Lansing area. MMPC members will work in groups and then send photos to mmpclansing@gmail.com for posting. Based on the Facebook survey of MMPC members and member interest in Adobe Lightroom, The Mid Michigan Photography Club is pleased to sponsor an interactive workshop to help members to use Lightroom to improve their images. John Stine will lead the workshop on Saturday, June 23, 2018 the First Presbyterian Church, 510 W Ottawa St, Lansing, MI from 8:00 a.m. until noon. Registration costs will be $20 for MMPC members and $40 for non-members. A registration opportunity will be available at the June MMPC meeting on Wednesday June 6. The registration form for the event is available at Lightroom Registration Form and can be mailed with payment to 10727 Keefer Hwy, Portland, MI 48875 or the registration form can be submitted at the June MMPC meeting. Attendance will be limited to the first 30 registrants. Big Cookie images are in the gallery at http://mmphotoclub.com/competitionbig-cookie/. The theme for the next Big Cookie competition in June 2018, is Building(s). The June meeting of the Mid-Michigan Photography Club is scheduled for 6:30 p.m. on Wednesday, June 6, 2018 at the First Presbyterian Church, 510 W Ottawa St, Lansing, MI. Greg Baran will present a Pic and Share. Saturday, May 19, 2018 at 8:30 a.m.
Based on the Facebook survey of MMPC members and member interest in Adobe Lightroom, The Mid Michigan Photography Club is pleased to sponsor an interactive workshop to help members to use Lightroom to improve their images. John Stine will lead the workshop on Saturday, June 23, 2018 the First Presbyterian Church, 510 W Ottawa St, Lansing, MI from 8:00 a.m. until noon. Registration costs will be $20 for MMPC members and $40 for non-members. A registration opportunity will be available at the June MMPC meeting on Wednesday June 6. Online registration will be announced at http://www.mmphotoclub.com.